Panelists Nur Mood, Emily Larson and Chris Dolan with panel moderator Gary Boelhower. As part of the College's annual Feast of St. Scholastica celebration on Feb. 9-10, the College hosted a panel discussion featuring three alumni who shared their thoughts on the meaning of the Benedictine Values. 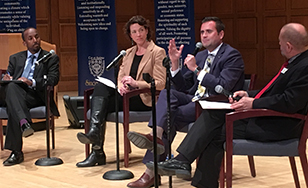 The panel consisted of Duluth Mayor Emily Larson, a 1995 graduate; Christopher Dolan, a 2001 graduate and chairman of the Board of Trustees; and Nur Mood, a 2012 graduate and Alumni Board member. Panelists discussed how their time at St. Scholastica had shaped them and impacted their lives, and reflected on the College's Benedictine values of respect, hospitality, community, stewardship and love of learning. "For me, love of learning means being in a state of constantly wanting to know more and understand more," said Dolan, an attorney at Faegre Baker Daniels LLP in Minneapolis who focuses on environmental law. "I'm fortunate to be in a career as a lawyer where that's expected." Even though he learned everything he knows about environmental law on the job, Dolan explained, it was his formative college years that made that learning possible and opened his mind. "My education here at St. Scholastica ... provided the foundation for critical thinking skills, for living a value-driven life." Mood, who moved from war-torn Somalia to the Twin Cities with his family, talked about how he had been a bit apprehensive about coming to St. Scholastica as a Muslim. In the end, he found that the community members of St. Scholastica truly live out the value of hospitality. He told a story about how he had nervously emailed a professor asking if he could take time off to celebrate a religious holiday with his family in the Cities. The professor wrote back almost immediately. "Go have fun with your family," the professor wrote, according to Mood. "When you come back, can you share about Islam and your faith with the whole class?" From then on, Mood became something of an ambassador for Islam on campus. It put him on the path to his current job as coordinator of Religious & Spiritual Life Programs at the Wesley Center at Hamline University. "That was the beginning of my journey," he said. Larson offered her thoughts on her favorite Benedictine value, respect. She gained an appreciation for this value during her time at St. Scholastica, and it has helped her in her life as a politician as well as in her personal relationships. "We all know the feeling of being disrespected, and we all know how different it is when someone offers you respect and you accept it and give it in kind," Larson said. "That exceeds any kind of divisions we have ... it's one of those exponential things, I find. Every time I take the high road, or I offer respect first, it multiplies. There's more to give." The discussion was moderated by Theology and Religious Studies professor Gary Boelhower, Ph.D. and was held from noon to 1:40 p.m. Thursday, Feb. 9 in the Mitchell Auditorium.